Samsung’s CES booth #15006, on Level 1 of the Central Hall in the Las Vegas Convention Center is open from January 9-12, 2018 and is the booth to visit to see these beauties. Through a single Thunderbolt 3 cable, CJ791 users can link and dock their monitor and laptop without extensive wiring. The Thunderbolt 3 connection provides processing speed of up to 40 Gigabits per second (Gbps). This is a rate nearly four times faster than USB alternatives – allowing users to enjoy connectivity across a full ecosystem of docks, displays and peripheral devices including Macs, USB type-C laptops, and other desktop accessories like storage drives or external graphics cards. The Thunderbolt 3 interface also enables the CJ791 to provide up to 85 watts (W) of laptop charging power. The CJ791’s clear, detail-rich design empowers business users to complete a range of tasks more efficiently. A 21:9 aspect ratio provides more screen real estate for multitasking, while a complementary 3440×1440 ultra-wide QHD resolution elevates content and imagery with nearly 2.5 times the pixel density of full HD alternatives. In turn, professionals can view large files, spreadsheets and data tables in a more readable format, and without extensive scrolling or zooming. 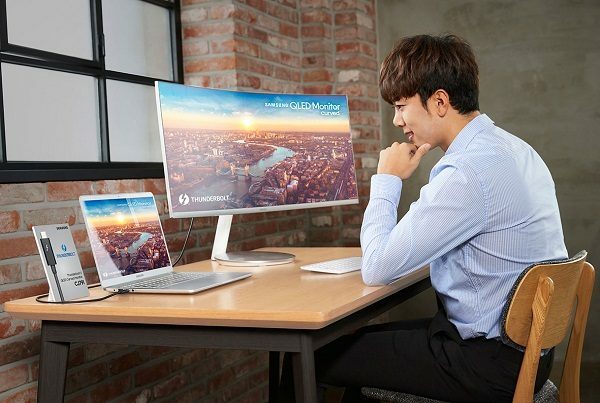 Professional users can also enjoy the flexibility to customize the CJ791 to their unique workspace, certain to please even the most demanding professional gamer, Graphic Artist or Photographer, to quote Seog-gi Kim, Executive Vice President of Visual Display Business at Samsung Electronics. 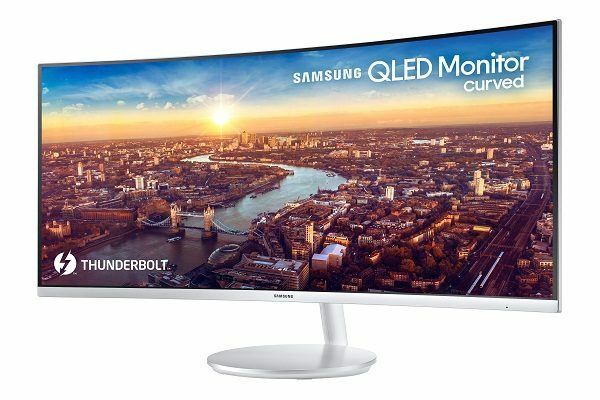 “As the pioneer of the curved monitor industry, Samsung continues to seek new ways to refine our displays and exceed consumers’ expectations on heightened performance and presentation”. Along with the wire-reducing Thunderbolt 3 connectivity, the CJ791’s slim-depth and narrow-bezel design accommodates multi-display setups without sacrificing content consistency or visual appearance. The display’s height-adjustable stand and tilt functionality also empower users to customize positioning and work within their most comfortable viewing parameters. Samsung’s CJ791 showcases content with brilliant and realistic detail, guaranteed to entice gamers and entertainment enthusiasts. The display’s QLED presentation technology precisely reflects colors across a 125 percent sRGB spectrum, and creates visual intrigue through deeper blacks, brighter whites and pristine shades. This refinement, coupled with the industry’s sharpest 1,500R curvature and ultra-wide 178-degree viewing angle, gives users a complete view of their surroundings, and ensures full immersion in every scene. 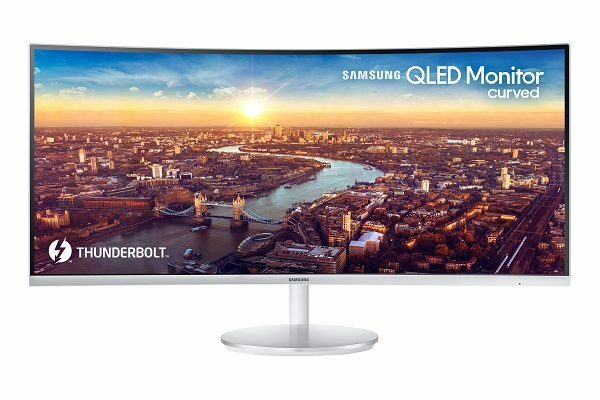 In a nutshell, the CJ791 QLED Monitor featuring Thunderbolt 3 connectivity Streamlines Performance and Enhances Content Presentation for Entertainment and Professional Users, making it a must-see for visitors to CES 2018!